We cannot thank you guys enough. Thank you - job well done. 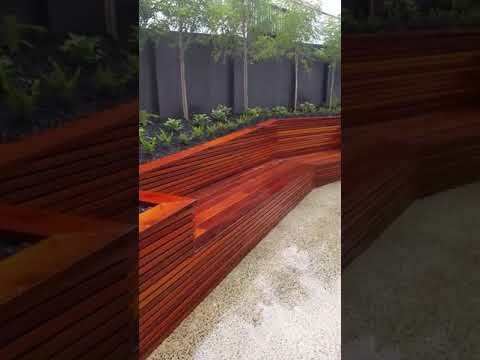 "We engaged Down2Earth to transform our backyard which included building new retaining walls, earthworks and soft landscaping. They did a great job, reliable, informative and reasonably priced. I would recommend their services and would certainly use them again in any future projects. " "We used Darryl and Chris for some landscaping work two years ago (schist feature wall with vitex plantar boxes/seating, stone vegetable garden and strip paver path with mondo grass. Satisfied with the quality of their work, we decided to use them again to build a vitex deck and paved barbeque area. The job ran to the timeframe as outlined to us. Both were a pleasure to deal with. This was down to the fact they were both approachable and professional, were transparent with their quote &… responsive with their communication. Hard working blokes who managed to complete our deck quickly with an exceptional quality finish! Tidy and respectful of your home while undertaking their work. Very happy with the final outcome and have no hesitation to recommend to family and friends." "Down2Earth have just finished a project at my house, transforming a weed-filled backyard into a lovely structured garden, with built-in seat/raised planter boxes/blade waterfall/tiled patio/screen/new artificial lawn/fully planted. Darryl's quote was the most professionally presented I have ever seen, clearly itemised/detailed and well priced. He and Chris were punctual, tidy, very helpful and pleasant to have around. Darryl came up with some great ideas for the installation of the blade… waterfall, even down to handmaking a concealed perspex chute and bringing from his home some plastic grille for stones to sit on. Can do guys. Really go above and beyond to ensure you will be happy with their work. Highly recommend." "Great job, would highly recommend! Awesome value for money and a pleasure to deal with. The quote was transparent with costs broken down and easily understood. Turned up on time and did a fantastic job with a high quality finish. Will definitely get Darryl and Chris back for further landscaping work and will be recommending to family and friends. " "Excellent service, highly recommend Darryl and team for a job well done. " "Darryl and Chris did a great job of laying a cobble stone path for us and mowing strip for the lawn. Very professional job, thanks fellas. " "As a landscape designer, I recently engaged Darryl and his team to undertake installation of a landscape plan I had just completed for two elderly clients. I had not used Darryl's services before and have been very impressed with his customer service and the quality of his workmanship. From the start Darryl was easily contactable, his quote for the project was timely and well-priced and he was able to commence the project before originally anticipated. He organised any sub-contractors in a… timely manner so the whole project ran smoothly and as a result the clients and myself as project manager, were very happy with the outcome. Would not hesitate to use Darryl and his team again on future projects on behalf of my clients." "The work completed by both Darryl & Chris from Down2Earth Landscaping was of a high standard and very professional. They both showed practical skills and experience in their field to help us create a fantastic entrance and surroundings. We would be more than happy to use them again and they come highly recommended from us. " "We love the work that Darryl did for us. Now our garden looks amazing and well beyond our expectation. Besides his workmanship, he was very patient in explaining the details and provided his professional recommendations where needed. Also, I never see any job quotes that Darryl did - itemized quote which details the everything I need to know so we are absolute clear what we am paying for. Highly recommend !! Thank you !" "Down2Earth Landscaping - Darryl was very prompt in response to my initial contact for a quote for Landscaping work to be done. He organised everything to be done efficiently, worked quickly and tidily, very pleasant to deal with and helpful with any extra requests. I definitely would recommend Down2Earth Landscaping and Darryl - I will certainly be contacting him again for any future jobs I may have." "Darryl and Chris are a great team and a pleasure to work with - highly recommended"
"We approached Darryl at Down2earth to have an area of lawn replaced with paving slabs. All communication was prompt and efficient. Work was carried out to very high standard. Really pleased with results and would highly recommend these hard working guys to anyone. " He was pleasant and easy to deal with - nothing was too much problem "
"Very pleased with the finished result, colored concrete patio with decorative and construction cuts to give a paving look. Darryl was very helpful and accommodating to changes and extras to give a completed look.He is top of the list for our next project!" "Darryl and Chris were recommended to me by Sandra Batley to landscape my front backyards which included digging out the existing lawns, pavers, trees constructing areas for new trees, paved area and laying of ready turf. These guys had communication, managed their time well, kept me informed, did fantastic job and were really friendly. I'd use them again and have recommended to friends. Thanks Guys....Thanks Sandra." "Darryl came to have a look at the new retaining wall we wanted to put in topped with ready lawn, a new path and a new garden built in another area. Darryl came up with a few ideas we hadn't thought of and we were happy to go with those. The quote was prompt (which was very reasonable), which we accepted. Work was started shortly after and was completed in a fast 3 days! The finished job looks fantastic and we are thrilled with the result. It has completely transformed our backyard. I would… highly recommend Down2earth landscaping and we will definitely use them again. Thanks for a job well done!" "Darryl has just built a fence for me. He responded quickly whenever I contacted him by email and he did what he said he would do. The work is great, the advice was good, the site was left tidy and the whole experience was the way such things should be, but seldom are. Will be happy to contact Darryl if I have more work to be done." "Great team, fabulous work highly recommended, tahnks"
"Darryl has done an amazing job on transforming our gardens, he has been fantastic to deal with, always on time, great communication and the quality of work is excellent. I would highly recommend Darryl and his business." "Darryl provided a very professional service, from the time he came to look at the job, listened to us and also gave some great suggestions, kept in contact regarding quotes when he said he would and let us know about timeframes etc. We were delighted with the finished work, and also the way everything was cleaned up at the end. We highly recommend him to other customers. "Darryl and his company did an excellent job. Very professional and a lot of attention to detail. Happily accomodated last minute requests. We look forward to using him again in the future. Highly recommended!" "I have used Darryl on a number of occasions to implement my conceptual designs for various clients around Auckland. Darryl works hard, communicates well and does a great job in general. would highly recommend Down 2 Earth Landscapes." "Darryl has been working on various tasks on my property over the last few months. His landscaping knowledge is first class as is the effort he puts into each job. Down2Earth offers very competitive rates and I have found Darryl very reliable and very obliging especially with the last minute jobs that always come along." "Having just moved to a new house I had been having a LOT of trouble with suppliers and contractors - someone had started a garden job but didn't finish, people didn't return calls or turn up and I was generally getting messed around. I was left with an unfinished job and some extra requirements - the building and painting of two trellises, installing an irrigation system and a lot of general garden maintenance and planting. I contacted Darryl on a recommendation & he came back to me really… quickly - I got a quote promptly and the whole job was down within a week. I have since used him for a second job. Darryl's standard of work is extremely high with a strong attention to detail, he is knowledgeable about landscaping, building and all garden and planting needs and is very customer focused. I cannot recommend Darryl & his team enough - he offers good rates, is efficient and friendly, he listens and offers good, practical advice and did a stunning job! The garden looks great and the sprinkler system is a dream! 10 out of 10." "Darryl did a great job of our landscaping, took a plan I had suppied and made suggestions/alterations to better it from his experience. Communication was very good. Bothe email and verbal. Kept me informed through the whole process. Prompt and reliable. Turned up when h said he would. Job completed to a high standard. Tidied up at the end of each day and left site clean and tidy at the completion of the job. Down2Earth is company with the objective of constructing your garden in the most efficient way possible, with a remarkable outcome! We specialise in hard and soft landscaping including stonemasonary. Get your Landscaping done in Less than TWO Weeks! We build basically anything outside! We have a qualified stone mason specialising in loose schist and shist veneers.